The best payment gateway provider in India for e-payment through credit card, debit card & netbanking. If you are unable to load the form, then please clear the browser history and then refresh the page . 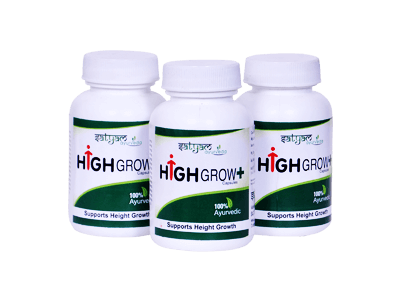 High Grow Plus® is a revolutionary breakthrough product manufactured by Satyam Ayurveda using rare and premium herbal extracts for guaranteed potency, High Grow Plus powerful herbal formula is very helpful in enhancing height and overall growth of the body. It also improves body posture, regenerates bone growth, improves flexibility and helps growth in joints, cartilages and disc. Bone expansion and growing taller occurs at the growth plate in your bones. Growth plates are only open during childhood and teenage years. During age 23, your growth plates close making further height progress not possible. Your bones require particular amounts of proteins, minerals, vitamins and growth hormones to grow to their maximum length. High Grow Plus® provides your bones with best amounts nutrients to enhance their growth.